The Michigan Chamber, the Michigan Bankers Association and the Michigan Farm Bureau Had Some Of The Most Active PACs In 2018. 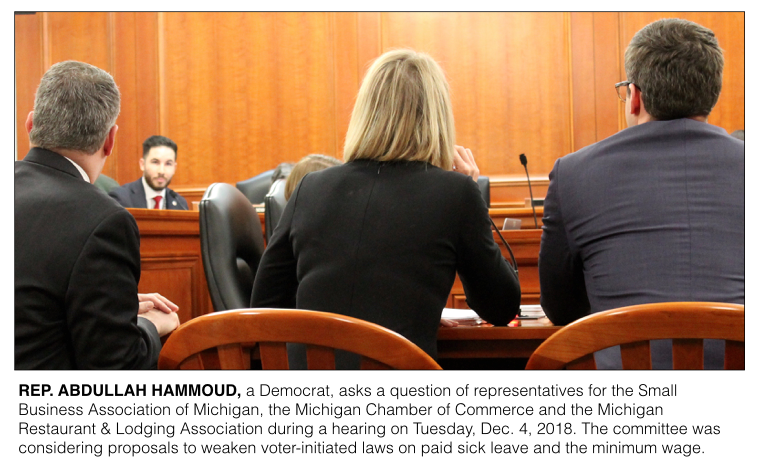 LANSING (DEC. 4, 2018) — The business groups asking state lawmakers to weaken voter-initiated laws that increased the minimum wage and required paid sick leave have been heavy financial supporters of lawmakers’ campaigns. Political action committees (PACs) connected to 10 business groups that spoke out in support of overhauling the new laws have spent $1.19 million to benefit current lawmakers and their caucuses in 2018, according to a new analysis of campaign finance disclosures. Those disclosures cover only through Oct. 20, 2018. The $1.19-million total includes direct giving to current lawmakers’ campaigns and caucuses and independent spending in support of current lawmakers. For the analysis, the Michigan Campaign Finance Network (MCFN) tracked the giving of PACs connected to seven groups that spoke out in support of both Senate Bill 1175 and Senate Bill 1171 during a Senate committee hearing on Nov. 28, according to the official minutes of that meeting. MCFN also tracked the giving of PACs connected to three groups that spoke out in support of just one of the two bills. The full Senate approved the bills on Nov. 28 after the committee meeting. The bills are now before the state House, which is expected to consider them today. Senate Bill 1175 aims to weaken the voter-initiated law to require employers to provide paid sick leave. Lawmakers approved the voter-initiated proposal in September in order to keep it from going to the ballot and to make it easier for them to change it later, which they are now attempting to do. Senate Bill 1171 is the proposal to change the voter-initiated minimum wage law. The voter-initiated proposal increased the hourly minimum wage — currently $9.25 an hour — to $12 beginning Jan. 1, 2022.The new bill increases the minimum wage more gradually to $12 by 2030. It also eliminates the current requirement that the wage be adjusted based on inflation. Plus, it blocks the proposal’s language that gradually increases the minimum wage for tipped workers to match the traditional minimum wage. Seven groups spoke out in support of both bills during the Senate committee meeting. The following is a list of their PACs and how much they’ve spent in support of current lawmakers and their caucuses this year. 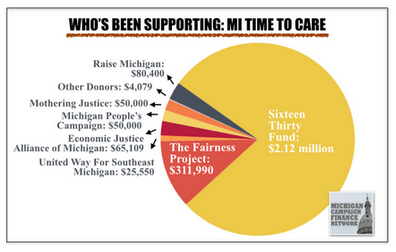 The Michigan Chamber of Commerce has both an active PAC and an active super PAC. — Michigan Licensed Beverage Association PAC, $14,300. The PAC of the Michigan Restaurant & Lodging Association, which has led the charge against the minimum wage proposal, spent more during the October 2018 campaign-finance quarter than it had in any quarter since 2010. 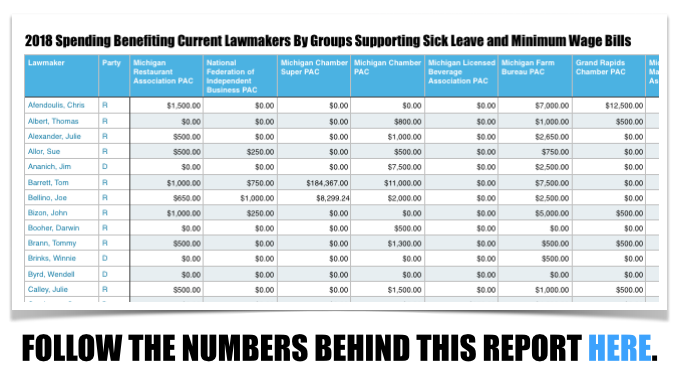 Three other groups with active PACs spoke out in support of only Senate Bill 1175, which covers the paid sick leave requirement, according to the committee minutes. The Small Business Association of Michigan has both a PAC and super PAC. — Michigan Retailers Association PAC, $13,050. A super PAC can receive money from corporations but must spend its money independently of candidates. Traditional PACs usually give their dollars directly to candidates. A full breakdown of the PACs’ spending in support of individual lawmakers is available here. Only about 6 percent of the PACs’ spending supported Democratic lawmakers. The top beneficiaries of the groups’ spending in 2018 were Republican Rep. Tom Barrett ($205,017), Republican Rep. Brandt Iden ($88,273), Republican Rep. Laura Cox ($83,500), Republican Rep. Jim Runestad ($69,050) and Republican House Speaker Tom Leonard ($54,850). Barrett, Cox and Runestad ran for the Senate this year. Iden ran for re-election. Leonard ran for attorney general. The Senate Republican Campaign Committee, which supports GOP candidates for the Senate, received $79,100 from the groups this year. The House Republican Campaign Committee, which supports GOP candidates for the House, received $65,500 from the groups this year. Tracking the financial giving of those opposing the bills is more difficult because few interest groups with PACs spoke out against the proposal in the Senate committee. Also, the signature-gathering campaigns to get the proposals before lawmakers received substantial funding from nonprofit organizations that don’t have to disclose their donors. Representatives of Progress Michigan, the AFL-CIO and the American Federation of State, County and Municipal Employees (AFSCME) Council 25 did oppose the bills in committee. The AFL-CIO’s PAC, the AFSCME People PAC and the Progress Michigan Political Action Fund, a super PAC, spent a total of $63,353 in support of current lawmakers and their caucuses in 2018. All of their spending benefited Democratic lawmakers. The voter-initiated minimum wage proposal came from Michigan One Fair Wage, which received about $1.0 million of its $1.61 million from groups connected to the Restaurant Opportunities Center, a nonprofit advocacy and workers’ rights group. The voter-initiated sick leave proposal came from MI Time To Care, which received about $2.12 million of its $2.75 million from the Sixteen Thirty Fund, a Washington D.C.-based nonprofit.